Are you at high caries risk? ‘Caries’ is not a typo. Specifically, it is called ‘Dental Carries? ?’ It is actually a dental disease that creeps up on you and exposes itself when you least expect it. So what is it exactly? It is a scientific term that describes cavities and other forms of tooth decay. This is one of those diseases that is not apparent early enough and when you do find yourself with the symptoms, it is usually a little late. Fortunately, there are treatments for that, but no permanent cure. How does one ‘get’ Caries? Nobody really ‘gets’ it, to be honest. The onset of Caries happens as with all other dental diseases. And that is the periodic neglect of your teeth and gums. As you know, there are certain bacteria present in the mouth, some useful and some useless. Literally. These parasitic bacteria break down food particles and excrete acids as a by-product. Acid is never a pleasant thing, especially in your mouth. These acids are strong enough to dissolve the minerals in the ‘enamel’, which is a layer protecting your teeth. When enough of it is eroded, the acids begin their work on your actual teeth. Our saliva is alkaline in nature and it is equipped to neutralize those acids, but it can only do so much before it’s too much to handle. And in due course of time, you really begin to feel the effects of those acids melting your teeth slowly. But, by that time it is too late to reverse Caries. Can’t eat that ice-cream? Too cold? Can’t have warm milk because it’s too hot? Food getting stuck in places on your teeth with unusual regularity? This means that your teeth have become too sensitive or there are cavities in your teeth. That’s when the alarm bells should go ringing. These are the symptoms of a Caries onset. How do I find out if I am at risk? Poor dental hygiene is your first indicator. In layman terms, if your breath is insufferable and your teeth look yellow, you know something’s off. The other thing that puts you on that path to ‘getting’ Caries, is your sweet-tooth. When you are having the time of your life eating foods that are high in sugars and carbohydrates, so are the harmful bacteria in your mouth. That’s not to say you should stop eating or having fun with pizza all together. ‘Everything in moderation’ is the key, along with proper dental hygiene. So pick up that toothbrush and start brushing! Dental sealants can be used to prevent dental caries. 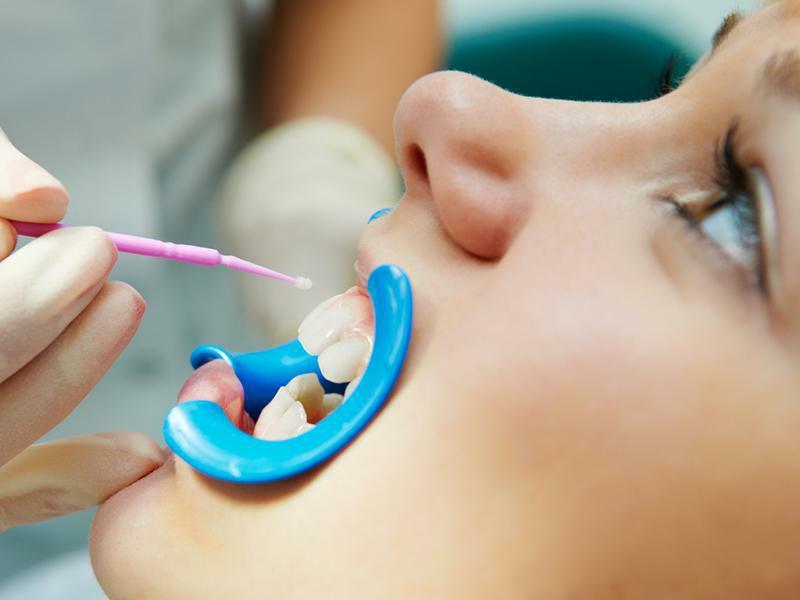 A sealant resembles a thin plastic-like coating which is put on the molar surfaces so as to prevent any food bits from getting stuck inside your mouth. The resident plaque bacteria do not get their share of carbohydrate which means that lesser fissure caries are formed. You should visit your dentist often to get the sealants checked. Consuming foods which are filled with calcium, like milk and green vegetables, provides protection against caries. Fluorides are also known to be an effective barrier against tooth decay as they bind themselves to the hydroxyapatite crystals present in the enamel. You can never be too careful when it comes to your teeth!